In order to reduce sedentary behaviour at work, research has examined the effectiveness of active workstations. However, despite their relevance in replacing conventional desks, the comparison between types of active workstations and their respective benefits remains unclear. The purpose of this review article is thus to compare the benefits between standing, treadmill and cycling workstations. Search criteria explored Embase, PubMed and Web of Science databases. The review included studies concerning adults using at least two types of active workstations, evaluating biomechanical, physiological work performance and/or psychobiological outcomes. Twelve original articles were included. Treadmill workstations induced greater movement/activity and greater muscular activity in the upper limbs compared with standing workstations. Treadmill and cycling workstations resulted in elevated heart rate, decreased ambulatory blood pressure and increased energy expenditure during the workday compared with standing workstations. Treadmill workstations reduced fine motor skill function (ie, typing, mouse pointing and combined keyboard/mouse tasks) compared with cycling and standing workstations. Cycling workstations resulted in improved simple processing task speeds compared with standing and treadmill workstations. Treadmill and cycling workstations increased arousal and decreased boredom compared with standing workstations. The benefits associated with each type of active workstation (eg, standing, treadmill, cycling) may not be equivalent. Overall, cycling and treadmill workstations appear to provide greater short-term physiological changes than standing workstations that could potentially lead to better health. Cycling, treadmill and standing workstations appear to show short-term productivity benefits; however, treadmill workstations can reduce the performance of computer tasks. Physical demands in the work environment have declined in Western countries over the last decades resulting in new types of negative health concerns. Active workstations such as standing, walking and cycling may reduce sitting time and could enhance health and productivity at work. The benefits associated with each type of active workstation (eg, standing, treadmill, cycling) may not be equivalent. Cycling and treadmill workstations appear to provide greater short-term physiological changes than standing workstations that could potentially lead to better health. Cycling, treadmill and standing workstations appear to show short-term productivity benefits, while treadmill workstations reduce the performance of computer-related work. These results are relevant in order to optimise future workplace interventions. Workers and corporations should be able to look at the benefits and limits of each type of workstation and determine which one is most appropriate for workers’ specific needs and tasks. In 2013, costs associated with sedentary behaviour were estimated at $65.5 billion worldwide.1 Moreover, a shift from manual labour jobs to highly sedentary service industry and office-based professions has been observed over the last decades.2 Recently, researchers have begun to study interventions designed to break up and reduce sedentary time throughout the workday by replacing the sitting workstation, which promotes sedentary behaviour,3 with active workstations. Standing, treadmill or cycling workstations change the ergonomic paradigm of the 09:00–17:00 workday, allowing a change in posture (ie, sitting vs standing) and improved muscle activation (ie, none vs muscular contractions) during work activities (figure 1). Many studies suggest that active workstations could reduce sedentary time at work,4–6 maintain work productivity,6 increase energy expenditure,7 regulate high blood pressure,8 relieve back pain,9 enhance positive affect10 and increase cognitive abilities11compared with conventional seated workstations. Type of active workstations included in the systematic review. Considering the growing body of evidence that suggests that standing, treadmill and cycling workstations may improve health and productivity at work compared with seated workstations, it would be relevant to have a better understanding of what benefits are specific to each of these active workstations. The purpose of this review article is thus to compare the benefits between standing, treadmill and cycling workstations. To be included in this review, studies were required to be published in peer-reviewed academic journals, written in English and respect Participants, Interventions, Comparators, Outcomes, Study criteria (table 1). Participant criteria included adult population, healthy or with cardiometabolic disorders and free of musculoskeletal complaints. Studies were required to include at least two types of active workstations. Both laboratory and free-living environment intervention protocols were included. Studies also needed to evaluate biomechanical, physiological, psychobiological and/or cognitive outcomes. Studies were excluded if active workstations were not standing, treadmill or cycling based, and included ‘interest of use’ or ‘social acceptance’ outcomes. 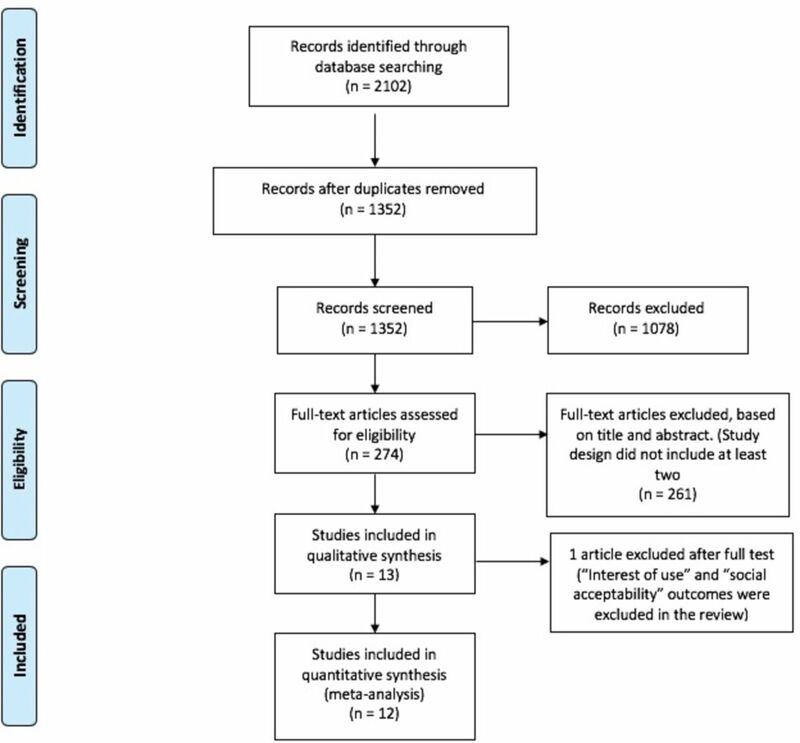 A computer-assisted systematic search of Central, Embase, PubMed and Web of Science databases was conducted on 13 March 2018 and included all studies prior to that date. The following keywords were used: ‘desks’, ‘workstation’, *work station, *works station and the following Boolean phrase: active OR bik* OR cycling OR ‘height adjustable’ OR stepping OR ‘stand up’ OR standing OR treadmill* OR walk* OR elliptical OR bicycl* OR pedaling OR ‘stability ball’ OR ‘stability balls’ OR ‘exercise ball’ OR ‘exercise balls’ OR ‘swiss ball’ OR ‘swiss balls’ OR ‘sit-to-stand’ OR ‘sit stand’. A first study selection was completed independently by two reviewers (FD, FL) based on the ‘inclusion of at least two active workstations’ by screening titles and abstracts. A final selection was made according to eligibility criteria by one reviewer (FD) using full texts. Data extraction process was completed by FD. Relevant outcomes were collected, analysed and summarised. Only significant differences (ie, mean values, z-scores, percentile, and so on) were reported in the review. Effect size (Cohen’s d) has been calculated for all significant differences. Two authors (FD, FL) used the modified Downs and Black checklist12 based on 27 ‘yes’-or-‘no’ items across five sections of quality assessments to determine risk of bias: (1) study quality; (2) external validity; (3) study bias; (4) confounding and selection bias; and (5) power of the study. Out of the 1352 studies identified through computer search, 274 examined the effects of active workstations (figure 2). Twelve studies met eligibility criteria (table 2) and their quality was assessed (table 3). Studies were diverse in terms of outcomes, measures and study design. Selected studies used different taxonomies to define ‘active workstation’, and we regrouped them as follows: (1) standing workstations, (2) walking workstations (speed expressed in km/hour), and (3) pedalling/elliptical workstations (power expressed in watts (W) and in maximum aerobic power (MAP)). Conventional seated workstations were present in selected studies, but are beyond the scope of the present review. Preferred Reporting Items for Systematic Reviews and Meta-Analyses (PRISMA) flow diagram. One study13 examined the biomechanics of three active workstations using electromyography of the trapezius and erector spinae, trunk and head 3D kinematics and physical activity quantified by accelerometers on the legs, trunk and arms. Twelve participants were asked to complete general office tasks (ie, typing, reading, correction, telephone use, mouse dexterity and cognitive tasks) while using active workstations. An increase in right trapezius activity was observed from standing to treadmill2.5 km/hour workstations: 3.8% vs 8.1% of maximum voluntary contraction (median values), respectively. Also, all variables concerning the intensity of movement (median and 95th percentile) increased in treadmill0.6 km/hour and treadmill2.5 km/hour conditions compared with standing, except for the physical activity intensity of the head at the 95th percentile for treadmill0.6 km/hour which remained similar to the standing condition. Six studies8 13–17 reported physiological outcomes. Four13–16 included adults with no health issues (n=109) and two studies8 17 included adults with overweight or class 1 obesity who also had prehypertension or impaired fasting glucose (n=22). From those four studies, mean heart rate (HR), blood pressure, energy expenditure, perceived exertion and pressure pain thresholds were assessed. All studies except one17 showed no difference between workstations. Increased HR was observed in all four studies8 13–15 when using treadmill or cycling compared with standing workstations. Specifically, Botter et al 13 reported an increase of 12 beats per minute (bpm) using a treadmill2.5 km/hour (91 bpm) compared with standing (79 bpm), which was corroborated by Cox et al.14 Moreover, Straker et al 15 reported an increase of 5 bmp for the treadmill3.2 km/hour and an increase of 7 bmp for cycling30 W compared with standing workstations. All other conditions with lower power or speed (eg, treadmill1.6 km/hour; cycling5 W) did not result in an increase in bmp. Zeigler et al 8 monitored HR during a 12-hour period (08:00–20:00) and were specifically interested in two periods (ie, work hours (08:00–16:00) and postwork hours (16:00–20:00)). Results from the 12-hour period showed an increase of 4 bpm for both treadmill1.6 km/hour and cycling20 W conditions compared with standing. Results from the working hour-specific period showed an increase of 5 bpm for treadmill1.6 km/hour and 6 bpm for cycling20 W compared with standing. Results from postwork period showed no difference in HR between conditions. Two studies8 14 with different populations and active workstations examined mean systolic blood pressure (SBP) and mean diastolic blood pressure (DBP). Cox et al 14 found no difference in SBP and DBP measured during an intervention comparing standing and treadmill workstations. The second study8 monitored ambulatory blood pressure on adults with overweight or class 1 obesity meeting prehypertensive or impaired fasting glucose criteria over a 12-hour period (08:00–20:00). During the 12-hour period, a reduction of 2 mm Hg for cycling20 W and 1 mm Hg for treadmill1.6 km/hour was reported in SBP compared with standing. For the work hour period (08:00–16:00), a decrease in SBP of 2 mm Hg was reported for cycling20 W compared for both treadmill1.6 km/hour and standing workstations. In the postwork period (16:00–20:00), there was a greater decrease in SBP compared with the two periods mentioned above. SBP for cycling20 W decreased by 8 mm Hg compared with treadmill1.6 km/hour and 9 mm Hg compared with the standing workstation. DBP was similar between standing and treadmill1.6 km/hour conditions for all three periods. However, cycling20 W decreased DBP by 3 mm Hg compared with standing, and 2 mm Hg compared with treadmill1.6 km/hour workstations for the 12-hour period as well as decreased DBP by 3 mm Hg compared with standing during working hours. Energy expenditure and VO2 were measured in three studies.13 14 16 Botter et al 13 showed an increase in energy expenditure of 1.2 metabolic equivalent (MET) for treadmill2.5 km/hour workstations compared with standing. Cox et al 14 measured a similar increase of 1 MET from standing to treadmill1.61 km/hour. Tronarp et al 16 measured energy expenditure in kcal. In this study, energy expenditure increased between all three conditions: an increase of 2.9 kcal/min between cycling20%MAP and standing; an increase of 6.9 kcal/min between cycling50%MAP and standing. Two studies14 15 measured perceived exertion, both using the 10-point Borg Scale. In the first study, Cox et al 14 reported an increase in perceived effort and perceived breathlessness (ie, dyspnoea) on the treadmill compared with standing for all tasks, namely warm-up, silent reading, reading aloud and speaking aloud spontaneously. The second study15 reported higher perceived exertion for treadmill1.6 km/hour (1.74/10), treadmill3.2 km/hour (2.39/10), cycling5 W (1.66/10) and cycling30 W (2.61/10) compared with standing (0.95/10). Furthermore, higher perceived exertion was reported for greater power and speed on treadmill and cycling workstations (eg, treadmill3.2 km/hour and cycling30 W compared with treadmill1.6 km/hour and cycling5 W). Pressure pain threshold was measured in kilopascals (kPa) using a Somedic algometer on the right quadriceps, right ventral forearm and right trapezius.16 Only differences in the pressure pain threshold of the right trapezius between standing (16.8 kPa) and cycling20%MAP (39.3 kPa) were reported. Seven studies10 15 16 18–21 reported cognitive outcomes. The authors measured perceived and actual task performances (eg, typing, mouse, psychomotor performances), attention and short-term memory capacity as well as psychobiological (eg, arousal, boredom) outcomes. One study15 reported perceived task performance. Studies observed perceived speed and accuracy of typing, mouse pointing and combined keyboard/mouse tasks. Perceived work performance was assessed with a questionnaire. Participants rated perceived effect of the use of diverse active workstations on a scale of 1–5 (ie, 1=very enhanced to 5=very diminished). Results from the perceived typing questionnaire showed a decrease in performance for the treadmill1.6 km/hour, treadmill3.2 km/hour, cycling5 W and cycling30 W compared with standing. Perceived accuracy also decreased with the use of both treadmill1.6–3.2 km/hour and cycling5–30 W workstations compared with the standing workstation. In addition, a decline in perceived accuracy was reported for the low-intensity treadmill1.6 km/hour compared with the low-intensity cycling5 W condition. Questionnaire outcomes for perceived mouse pointing speed showed a decrease for treadmill1.6 km/hour, treadmill3.2 km/hour, cycling5 W and cycling30 W compared with standing. Also, a reduction of perceived speed was observed for both treadmill1.6km/hour and treadmill3.2 km/hour compared with both cycling5 W and cycling30 W conditions. There was a decline for the treadmill1.6 km/hour, treadmill3.2 km/hour, cycling5 W and cycling30 W compared with standing in perceived mouse pointing accuracy. There was a reduction in perceived accuracy for both treadmill workstations compared with low-intensity cycling5 W.
Questionnaire outcomes for perceived combined keyboard/mouse speed tasks showed a decrease in perceived speed for treadmill1.6 km/hour, treadmill3.2 km/hour, cycling5 W and cycling30 W compared with standing. In addition, a decline in perceived speed for both treadmill workstation conditions compared with both cycling workstation conditions was observed. Perceived accuracy decreased for the treadmill1.6 km/hour, treadmill3.2 km/hour, cycling5 W and cycling30 W compared with standing. Moreover, perceived accuracy declined for treadmill3.2 km/hour compared with the lower intensity treadmill1.6 km/hour and both cycling workstation conditions. Three studies15 16 20 examined the effect of active workstations on typing performance. Straker et al 15 examined the effect of active workstations on typing speed performance (words/min) and accuracy (% of typing errors). Typing speed was reduced for the treadmill3.2 km/hour (49.73 words/min), treadmill1.6 km/hour (50.14 words/min), cycling5 W (53.17 words/min) and cycling30 W (52.58 words/min) compared with standing (54.09 words/min). No differences were reported for the accuracy test. Tronarp et al 16 found that gross speed (ie, including erased typing errors) was reduced for the cycling50%MAP (45.5 words/min) and cycling20%MAP (46.5 words/min) compared with standing (47.0 words/min). Net speed (ie, excluding erased typing errors) was also reduced for cycling50%MAP (43.8 words/min) and cycling20%MAP (44.3 words/min) compared with standing (46.3 words/min). Moreover, typing errors (ie, number of errors) increased with both cycling50%MAP (20) and cycling20%MAP (16.3) compared with standing (13.8). No differences were reported between cycling50%MAP and cycling20%MAP. Ohlinger et al 20 measured the number of taps in a 10 s trial. A reduction in taping speed was observed for the treadmill workstation (55.8) compared with the standing workstation (57.0). To resume, all three studies observed decreases in typing speed with treadmill workstations compared with a standing workstation. The two studies15 16 with cycling conditions observed a decrease in typing speed compared with a standing workstation. Only one study16 observed a decrease in typing word accuracy with the use of cycling workstations compared with a standing workstation. Two studies15 16 examined mouse pointing speed (ie, milliseconds) and accuracy (ie, actual errors). The first study15 reported a decrease in speed for treadmill1.6 km/hour (1059 ms); treadmill3.2 km/hour (1107 ms); and cycling5 W (1022 ms) compared with standing (959 ms). Similar values were reported for cycling5 W and cycling30 W workstations (1022 ms). Both treadmill1.6–3.2 km/hour workstations resulted in decreased mouse pointing speed compared with both cycling5–30 W workstations. Furthermore, pointing error increased using treadmill1.6 km/hour (0.17), treadmill3.2 km/hour (0.20) and cycling30 W (0.16) compared with standing (0.10), and for treadmill3.2 km/hour (0.20) compared with cycling5 W (0.13). To resume this study observed that mouse pointing speed and accuracy decreased with treadmill workstations compared with a standing workstation. In addition, mouse pointing speed decreased with the use of treadmill workstations compared with cycling workstations. The second study16 reported a decrease in mouse pointing speed for standing (33.6 ms) compared with cycling20%MAP (32.6 ms). But contrary to the last study, a decrease in mouse pointing speed was reported for a higher cycling50%MAP intensity (33.9 ms) compared with standing (33.6 ms). Accuracy was assessed by the number of successful tasks. Results showed a reduction of successful tasks during both cycling50%MAP (3.5) and cycling20%MAP (5.5) compared with standing (7), and a decrease in cycling50%MAP (3.5) compared with cycling20%MAP (5.5). One study15 examined combined keyboard and mouse task performance (ie, speed (words/s) and error rate). A decrease in speed was observed for both treadmill1.6 km/hour (9.57 words/s) and treadmill3.2 km/hour (8.26 words/s) compared with standing (11.94 words/s). Furthermore, a decrease in speed was observed for the treadmill1.6 km/hour (9.57 words/s) and treadmill3.2 km/hour (8.26 words/s) conditions compared with the cycling5 W (10.84 words/s) and cycling30 W (11.17 words/s) conditions. No differences in error rate were reported between active workstations. Processing speed tasks were assessed in one study.19 Researchers used a psychomotor test (ie, detection test from Cogstate) to measure speed and reaction time to accomplish a simple task. Standing z-score and treadmill1.6 km/hour z-score showed a lower speed of performance than cycling20 W z-score. Cycling20 W reaction time was faster than standing reaction time. Out of the four studies18–21 that examined the influence of active workstations on attention and short-term memory capacity, none found differences between active workstations (ie, standing, treadmill and cycling) in selective attention. Moreover, divided attention and short-term auditory verbal memory revealed no differences between standing, treadmill and cycling workstations. One study10 reported psychobiological outcomes. With a 4 rating scale questionnaire, this study evaluated the level of arousal, boredom, stress and task satisfaction (eg, 1=definitely no to 4=definitely yes). The authors reported that treadmill workstations increased arousal compared with standing as well as cycling compared with standing. Boredom decreased with treadmill and cycling workstations compared with standing. Stress scores showed that treadmill workstations lowered stress compared with standing. The purpose of this review article was to compare the benefits between standing, treadmill and cycling workstations. This article reviewed 12 studies. Our main findings were that: (1) the benefits associated with standing, treadmill and cycling workstations may not be equivalent; (2) cycling and treadmill workstations appear to provide greater short-term physiological changes than standing workstations that could potentially lead to better health; and (3) cycling, treadmill and standing workstations appear to show productivity benefits while treadmill workstations seem to diminish the performance of work-related use of computers. No reductions in motor task performance were reported with the use of cycling workstations.15 24–27 Speed processing time in simple tasks does increase compared with treadmill and standing conditions.19 28 These productivity results are important as cycling workstations, compared with treadmill and standing workstations, allow workers to experience greater cardiometabolic gains, while maintaining acceptable levels of productivity in office tasks. Compared with standing workstations, treadmill workstations can positively influence many psychological components related to the work environment. A reduction in task stress, an increase in arousal, a lower feeling of boredom and a higher feeling of task satisfaction were reported by participants based on a single study.10 More studies are required to clarify the effects of low-intensity exercise similar to the effects described for treadmill workstations on workers’ mood. Some of these improvements may be explained by the increase in cardiovascular activity associated with an active workstation, possibly contributing to improved brain oxygenation, hence an improvement in cognitive tasks (memorisation and attention).11 29–33 However, the results of the current review did not provide evidence of any cognitive benefits from treadmill compared with cycling or standing workstations. With treadmill workstations, executive motor task performance, such as typing, or mouse pointing was reduced.15 25 34 Higher walking speeds (3.2 km/hour) produced greater muscular activity in the upper limbs than that observed in standing or cycling workstations. This increase in muscular demand of the trunk muscles and upper limb muscles in order to stabilise posture and gait may affect motor coordination related to computer tasks13 35 and could lead to muscular fatigue and muscle tension.13 In this context, safety issues should be raised, and further studies are required to ensure the safety of workers using treadmill desks. Active workstations are a novel intervention. The comparison of active workstations was available in 12 studies and only 11 specifically compared outcomes between active workstations. Also, the findings of this literature review are supported by short-term measures only. In addition, a large number of outcomes were provided by only one or two studies which both had relatively small sample sizes. As mentioned by other authors,42 larger randomised controlled trials with mid-term and long-term protocols are needed to provide stronger evidence. The benefits associated with standing, treadmill and cycling workstations may not be equivalent. Cycling and treadmill workstations appear to provide greater short-term physiological improvements compared with standing, which could potentially lead to better health outcomes. Cycling, treadmill and standing workstations appear to show short-term productivity benefits; however, treadmill workstations reduce the performance of computer-related work. With workers and the workplace slowly moving towards active workstations, future long-term studies integrating different types of active workstations should be conducted in order to provide additional evidence. Ultimately, workers and corporations should be able to critically examine the benefits and limitations of each type of workstation and determine which is most appropriate for the worker’s specific needs and tasks. The authors acknowledge the following individuals who contributed significant time and effort to the consensus development process and to the preparation of this manuscript: Denis Arvisais, Ryan Reid, Thiffya Arabi Kugathasan, Grant FIT24-Healthy and Productive Work Initiative (No 146019) by Social Sciences and Humanities Research and Canadian Institutes of Health Research.
. Absolute changes in regional cerebral blood flow in association with upright posture in humans: an orthostatic PET study. J Nucl Med 2001;42:707–12. Contributors FD and FL performed the literature review. FD and MEM designed the project. FD provided the first draft of the paper. All the authors revised and approved the manuscript. Funding Grant FIT24-Healthy and Productive Work Initiative (No 146019) by Social Sciences and Humanities Research and Canadian Institutes of Health Research.